^ Oration on the Dignity of Man (1486) 存档副本. [2016-02-07]. （原始内容存档于2011-01-04）. ^ Oration on the Dignity of Man (1486) wsu.edu 互联网档案馆的存檔，存档日期2011-01-04. ^ 3.0 3.1 3.2 Marek, Miroslav. Genealogy.eu. Pico family. 2002-09-16 [2008-03-09]. ^ Schoell, M. VIII. History of the Revolutions in Europe. Charleston: S. Babcock & Co. 1837: 23–24 [2008-03-09]. ISBN 0-665-91061-4. ^ Trionfi.com. Boiardo's Life: Time Table. [2008-03-09]. （原始内容存档于2009-08-06）. ^ 6.0 6.1 6.2 Baird, Forrest. 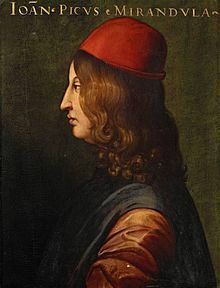 Giovanni Pico della Mirandola (1463-1494). Philosophic Classics. Prentice Hall. 2000 [2009-01-28]. （原始内容存档于2008-12-02）. ^ Medici writers exhumed in Italy. BBC News. 2007-07-28 [2007-07-28]. ^ Paul Oskar Kristeller, Eight Philosophers of the Italian Renaissance. Stanford University Press (Stanford, Caliornia, 1964.) P. 62. ^ 10.0 10.1 10.2 Lyber-eclat.net op.cit. ^ Ben-Zaken, Avner, "Defying Authority, Rejecting Predestination and Conquering Nature", in Reading Hayy Ibn-Yaqzan: A Cross-Cultural History of Autodidacticism (Johns Hopkins University Press, 2011), 65-101. ^ Moore, Malcolm. Medici philosopher's mysterious death is solved. The Daily Telegraph (London). 2008-02-07 [2008-02-07]. ^ Prof. Pier Cesare Bori. "The Italian Renaissance: An Unfinished Dawn? : Pico della Mirandola 互联网档案馆的存檔，存档日期2007-12-29.". Accessed Dec. 5, 2007. ^ see Ben-Zaken, Avner, "Defying Authority, Rejecting Predestination and Conquering Nature", in Reading Hayy Ibn-Yaqzan: A Cross-Cultural History of Autodidacticism (Johns Hopkins University Press, 2011), pp. 65-100. ^ Rank, Otto, Art and Artist: Creative Urge and Personality Development, Alfred A. Knopf, New York, 1932.